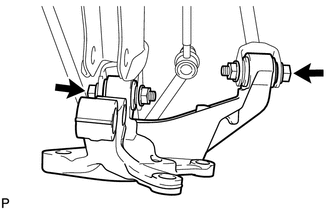 (a) Temporarily install the rear axle carrier sub-assembly with the 2 bolts and 2 nuts. (b) Install the rear axle carrier sub-assembly with the 2 bolts and 2 nuts. 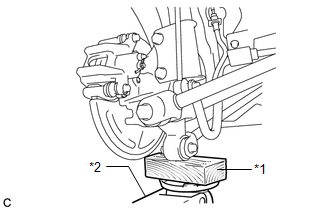 (a) Support the rear axle carrier sub-assembly using a jack and wooden block as shown in the illustration. Do not bend the brake dust cover. (b) Jack up the rear axle carrier sub-assembly LH to set the rear No. 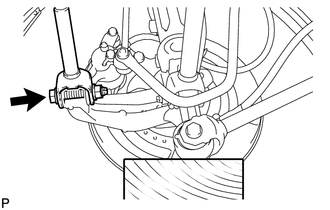 1 suspension arm assembly LH in the tightening position as shown in the illustration. Do not jack up the rear axle carrier sub-assembly LH too high as the vehicle may fall. If the rear No. 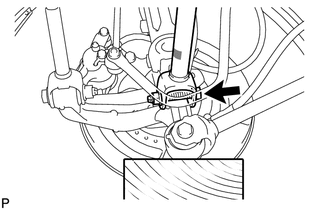 1 suspension arm assembly LH cannot be positioned as shown in the illustration even when the rear axle carrier sub-assembly LH is jacked up, apply additional load to the vehicle such as by having a person sit in the rear seat. The final torque must be applied under standard vehicle height conditions. (b) Jack up the rear axle carrier sub-assembly LH to set the rear No. 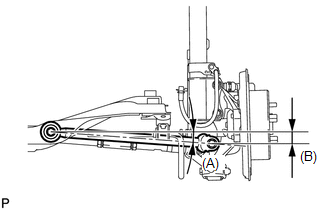 2 suspension arm assembly LH in the tightening position as shown in the illustration. If the rear No. 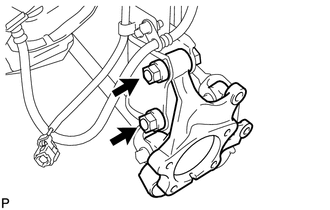 2 suspension arm assembly LH cannot be positioned as shown in the illustration even when the rear axle carrier sub-assembly LH is jacked up, apply additional load to the vehicle such as by having a person sit in the rear seat. 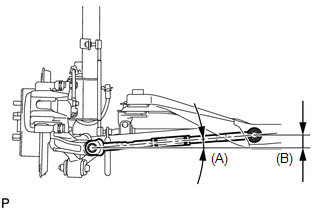 (a) Inspect and adjust the front wheel alignment (See page ). (a) Check for the speed sensor signal (See page ).